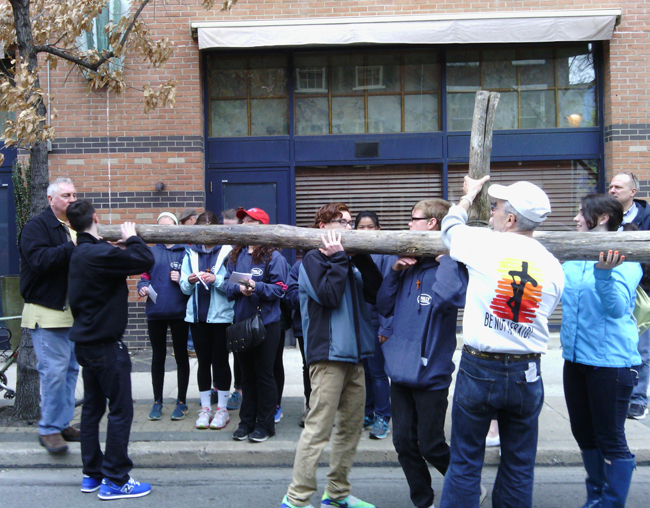 Local teenagers and their adult helpers hoist a cross for a procession and prayerful public witness called CrossWalk in which they carried the cross through the streets of center city Philadelphia on Good Friday, April 3. Many teenagers use the time off for Easter break to catch up with friends, go on vacation, forget about schoolwork or just relax. But one group of high school kids, mainly from the Philadelphia suburbs, spent their Easter break spreading the Catholic faith in center city Philadelphia. During Holy Thursday and Good Friday, April 2-3, the teens participated in events such as encouraging people at random to renew their faith by going to the sacrament of penance and greeting strangers with a smile. After an outreach on Holy Thursday near the Cathedral Basilica of SS. Peter and Paul, many participants took time to share stories of their encounters at St. Patrick Church in nearby Rittenhouse Square. “The best highlight is hearing two confessions from those going for the first time in 48 years,” said Father Daniel Hennessey, a priest of the Legionaries of Christ and spiritual director of the local chapter of Regnum Christi, a Catholic movement associated with the religious order. One teenager shared how she met a group of teens who told her that they were Catholic yet were unaware of the availability of confession. Because of her presence, the teens had a chance to seek through a priest the Lord’s mercy in the sacrament. For Ashley Huss, a full-time missionary of Regnum Christi Corps, it was her first time helping with the spiritual aspect of the group. “My best part would be talking to people and opening their eyes about the faith,” she said. Later that evening, on April 2, the teens took bags of food to homeless people on the streets of center city. Each homeless person was greeted with a warm hello, a smile and small conversation. On Good Friday, April 3, the morning began with a prayer vigil outside the Planned Parenthood clinic in center city. Pat Stanton, son of late John P. Stanton (founder of Pro-Life Union of Greater Philadelphia), spoke of an analogy between Planned Parenthood and Calvary, where Jesus was crucified and died. “We remember on this day when Jesus was crucified on Calvary,” Stanton said. “Likewise, babies are being aborted by doctors who reject God. Your presence matter everywhere,” he told the gathering’s participants. The group prayed peacefully and spoke with Planned Parenthood workers and escorts to consider changing their minds about working at the facility. Some members of the group took turns praying the sorrowful mysteries of the rosary. Dr. Monique Ruberu, a pro-life obstetrics/gynecology physician, then led the group in song with chaplet of divine mercy. After the prayer vigil, the group engaged in an activity called CrossWalk in which four different teams carry a heavy wooden cross, walk designated routes around Philadelphia, and collect prayer intentions from people around the city. Some of the intentions include those of family members, the sick and those who have fallen away from the Catholic faith. The group then gathered the intentions and offered them at the Good Friday liturgy at the cathedral. For Mary Sharkey, a cantor at St. Francis Xavier Parish in the nearby Fairmount section, it was the most moving experience of the two days. Later the group reenacted the living stations of the cross and processed around the Rittenhouse Square area to the cathedral. Augustus DeSimone, a missionary for Generation Life and parishioner of SS. Simon and Jude Parish in West Chester, was strongly moved by this prayerful procession.